D'Aubuisson: No street will carry your name! The mayor of San Salvador, Norman Quijano, has announced that the city will rename one of its principal streets for Roberto D'Aubuisson. Quijano, who is a member of the right-wing ARENA party founded by D'Aubuisson, plans to rename Calle San Antonio Abad, for the former major in the Salvadoran army. D'Aubuisson is one of the most infamous names from El Salvador's civil war. The tags most often associated with him are "sponsor of death squads" and "man who gave the order to assassinate archbishop Oscar Romero". The decision to name a boulevard for him has sparked outrage among those concerned with justice for victims of human rights abuses during the country's civil war. The 1979 coup d'etat altered the political landscape in El Salvador. 419 One of the competing factions directly affected by the coup was a core of military officers who sought to pre-empt the groups that had staged the coup and also any reform movement. 420 They considered the Government Junta to be "infiltrated by Marxist officers, which could be fatal for the independence and freedom of the Salvadorian fatherland if the anti communists in the population failed to act". 421 The leader of this faction was former Major Roberto D'Aubuisson, who up until 1979 had been third in command of ANSESAL and who, on being retired, kept part of the agency's archives. Former Major D'Aubuisson drew considerable support from wealthy civilians who feared that their interests would be affected by the reform programme announced by the Government Junta. They were convinced that the country faced a serious threat of Marxist insurrection which they had to overcome. The Commission on the Truth obtained testimony from many sources that some of the richest landowners and businessmen inside and outside the country offered their estates, homes, vehicles and bodyguards to help the death squads. They also provided the funds used to organize and maintain the squads, especially those directed by former Major D'Aubuisson. As the social conflict in El Salvador intensified, subversive operations increased. D'Aubuisson was well placed to provide a link between a very aggressive sector of Salvadorian society and the intelligence network and operations of the S-II sections of the security forces. He was virtually catapulted to undisputed national political leadership of the only faction capable "of preventing a left-wing takeover". 422 He then opted for applying what he saw as the only method used by the subversives: the illegal use of force. "An eye for an eye, a tooth for a tooth", as the saying goes. D'Aubuisson arranged meetings between powerful civilians and economic interests and groups in the armed forces, thereby combining two elements in a strategic relationship: the input of resources (money, vehicles, weapons, homes, etc.) by civilians and the definition of a political line for the operations of the S-II intelligence sections. This gave political meaning and purpose to the attacks on and intimidation of civilian opponents and individuals suspected of collaborating with or belonging to the guerrilla movement. For D'Aubuisson, having access to intelligence reports was of the utmost importance, because it served the cause and the functioning of his political plans. He lost no opportunity to infiltrate the security forces and the armed forces and elicit information from them. In line with D'Aubuisson's political project, all such information was used for "direct action", which explicitly included assassination attempts on individuals, abductions, "recovery of funds" and sabotage. After the assassination of Monsignor Romero, which, in very closed circles, D'Aubuisson took credit for having planned (see the case of the assassination of Archbishop Romero), his prestige and influence grew among the groups that wielded economic power, gaining him further support and resources. 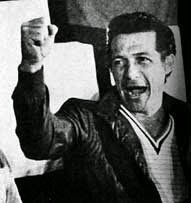 The San Luis estate incident and his temporary stay in Guatemala did not interrupt his political plans, since it was in Guatemala that he was able to establish contacts with internationally linked anti-communist networks and organizations and individual anti-communists such as Mario Sandoval Alarcón, Luis Mondizabal and Ricardo Lao. From Guatemala, D'Aubuisson continued to plan and direct numerous attacks by groups identified as "death squads" and, on his return to El Salvador, had access to sources which kept him permanently supplied with abundant, up-to-date intelligence information from most armed units or territorial districts, whose leaders shared his political views. They also offered him actual logistical support for his activities, seconding and rotating troops for his personal protection and supplying weapons. Although members of the Armed Forces Joint Staff knew about this steady leak of information, not only was nothing ever done to control it but intelligence leaks were even organized intentionally: in fact, there were serving members of the armed forces who participated actively in D'Aubuisson's group. There is substantial evidence that D'Aubuisson operated during this period through concealed channels in which civilians and both serving and discharged members of the armed forces mixed politics, murder and the defence of their own economic interests in their zeal to combat both the peaceful and the armed opposition. One of those closest to D'Aubuisson was his Chief of Security, Héctor Antonio Regalado. The Commission on the Truth obtained sufficient evidence to conclude that Regalado not only formed his own death squad in the town of Santiago de María but also used to coordinate and train D'Aubuisson's networks in the capital. Regalado ran D'Aubuisson's death squad from his office in the National Assembly, where he was Chief of Security when D'Aubuisson was President of the Assembly. Former Major Roberto D'Aubuisson gave the order to assassinate Archbishop [Oscar Romero] and gave precise instructions to members of his security service, acting as a 'death squad', to organize and supervise the assassination. See From Madness to Hope, Report of the UN Truth Commission on El Salvador. D'Aubuisson's died of cancer in 1992, shortly after the signing of the Peace Accords which ended El Salvador's bloody civil war. As a consequence, he was never prosecuted for involvement in those crimes, but the evidence is strong and well-known. D'Aubuisson is not someone most of us would pick to honor by naming a street for him. Needless to say, Quijano and ARENA see D'Aubuisson's legacy differently. They see him as the founder of their successful political party, and a man willing to do what was necessary to "bury the reds." In announcing his action, Quijano stated that D'Aubuisson deserved the honor as the leader in the National Assembly when the country adopted its current constitution. The shadow of the death squad organizer looms large over the political party he started. ARENA has a biography and tribute to D'Aubuisson on the party website, and a statue of D'Aubuisson stands in the party headquarters. Each year the party leadership gathers at D'Aubuisson's gravesite on the anniversary of his death to pay tribute to ARENA's founder. D'Aubuission already has a traffic circle and monument named for him in the municipality of Antiguo Cuscatlán which also has an ARENA mayor. In 2006 President Tony Saca, also from ARENA, spoke at the inauguration of that monument, of how D'Aubuisson had acted in Saca's view to keep the country from "the tragedy of marxist totalitarianism." The son of D'Aubuisson, Roberto D'Aubuisson, Jr., is currently an ARENA deputy in the National Assembly and is running for mayor of Santa Tecla in the 2015 elections. Human rights activists and others have reacted vigorously against Quijano's plan to honor D'Aubuisson. El Salvador's Human Rights Ombudsman, David Morales, indicated that he would open an investigation into the action as an offence against the human right to know the truth. This morning the Roman Catholic archbishop of San Salvador announced the church's opposition to the street name change from Calle San Antonio Abad, since the street was already named for a Catholic saint, and to name the street for D'Aubuisson would feel like learning that the man who directed the murder of your brother was getting an award. Archbishop Escobar Alas asked the mayor to reconsider his decision. In 2007, when a resolution was introduced in El Salvador's National Assembly to posthumously name D'Aubuisson a "son of highest merit," a similar backlash prompted the resolution to be withdrawn. There is a very specific reason he was nicknamed " Blowtorch Bob". Apparently picked the wrong faction. Using Lenin's tactics to deal with the acolytes of Lenin is a big no-no. If he'd thrown in his lot with the Left fascists, they'd be wearing his face on a t-shirt.